Nazareth School is adjacent to the historical site, Mission San Diego de Alcalá in the heart of Mission Valley in San Diego. It’s a school on a mission, too, educating children The Nazareth Way. 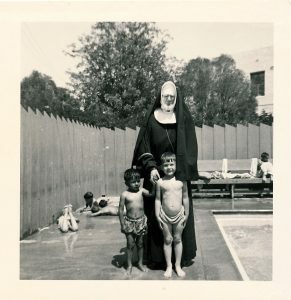 Outreach was the primary motivator in the early years, as the sisters worked to meet the physical and spiritual needs of local children. Sisters of Nazareth visited the site of California’s First Mission at the Bishop’s request. He had hoped the abandoned buildings could serve the sisters’ needs as they brought in additional children to nurture and educate. Unfortunately, the buildings were beyond repair. Mission San Diego de Alcala was rebuilt in 1931, and plans were developed for a new Children’s Home on the land adjacent to the existing mission grounds. The first Nazareth House and school in America opened nearly a century ago to care and educate children. 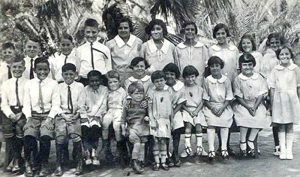 In the 1960’s, Nazareth School provided foster care and was considered a boarding school. A decade later, the Bishop of San Diego requested the facility be dedicated as a co-educational day school. 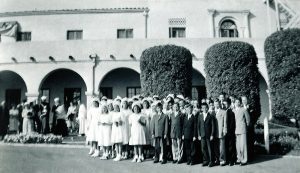 In August 2010, Nazareth School was incorporated as its own entity, Nazareth School of San Diego, Inc. The school is owned and supervised by the Sisters of Nazareth. It has evolved from an orphanage, to a foster care and boarding school, and finally, as a day school educating children from preschool through eighth grade. The curriculum has grown in sophistication but the sisters’ original mission remains the same: providing children with a strong awareness of their faith and a sound academic education to enable their abilities to make a difference in the world.